Craftsy’s Biggest Sale of the Year! Craftsy’s biggest sale of the year is going on right now! I know that this is the season to shower your loved ones with gifts, but why not invest in yourself, too? 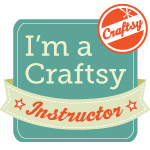 Craftsy is making that just a little easier by marking down ALL online Quilting classes to $19.99 or less, including mine, through Monday. Treat yourself to some incredible instruction and remember that you will own this class forever, and can take the class according to your own schedule. Click here to see all the great classes that are available for a bargain price through next Monday! Filed under Craftsy!. Comments Off on Craftsy’s Biggest Sale of the Year! We share amongst ourselves the wonder and passion for all things fiber. I am so grateful to my mom for getting me hooked on sewing at a young age; it has literally brought me decades of exploration and fulfillment. Happy Thanksgiving to you and yours! 1. Strengthen my mechanical skills at handling the ruler and moving the quilt at the same time. 2. Develop an artistic eye for how to create secondary designs from the quilting design. One thing I love about ruler work is one can easily create a framework or skeleton to hold free motion designs and when this framework is repeated across blocks, the result can be very interesting. That channel matters-can you see how much more “punch” that simple design has just by virtue of adding a channel? I thought about stitching something inside those crescents, but I’m learning that leaving some “empty zones” is very effective, so I left them as is. Overall, I like the block a whole lot better after the quilting has been added, so i think I’m on the right track! SewCalGal spent some time playing around with these files and did some really cool stuff. She took the bird block #2 files and stitched part as machine embroidery applique and the other part as purely embroidery with a trapunto layer! She also isolated the swirl shapes from Bird Block 2 and created a beautiful pillow using them in a mirror image format! This is a fabulous lesson in the versatility of machine embroidery…you can take a set of design files and play with them in many ways beyond their original purpose. To see what she’s done and learn more about how to play with design files, head on over to SewCalGal’s blog now! While you’re there, be sure to make a comment so you can enter the give away!